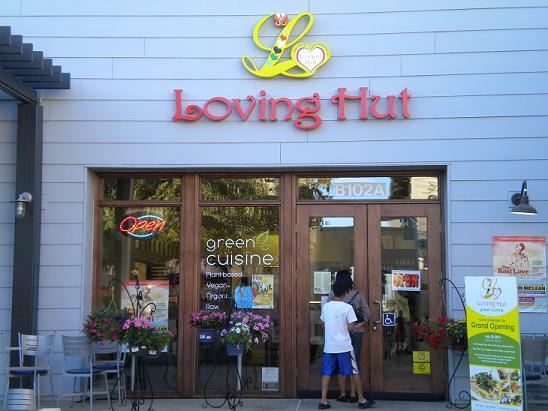 Loving Hut is a chain of vegan restaurants. There’s one in Upland (903 W. Foothill) and one opened this month in Claremont’s Village West. Each Loving Hut is united by its name and concept but each, interestingly enough, has its own menu. Claremont’s location is next to Le Pain Quotidien and the Laemmle Theater facing the public plaza. I’m a proud meat eater but one open to vegetarian or vegan cooking. For a better test, though, I brought along a vegetarian friend. 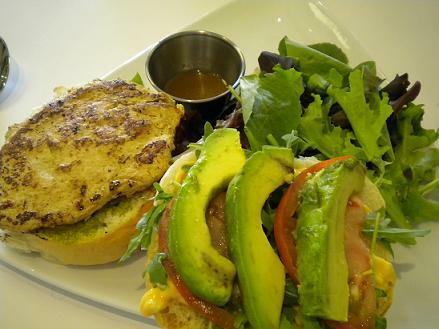 I had the Gardein burger ($12; photo at upper right), which puts a chicken-flavored soy patty on a wheat bun with tomato, lettuce, avocado, onion, pesto and spicy mayo, with a small salad on the side. 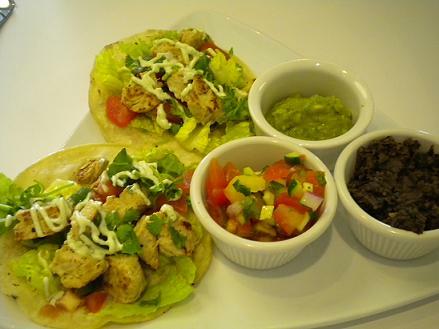 My friend had the tacos diego ($12; photo at lower right), with beef-flavored soy strips in corn tortillas with lettuce and flour-based Daiya cheese, with beans, salsa and avocado on the side. My sandwich wasn’t as dense as chicken but did taste similarly. (Of course, doesn’t everything taste like chicken?) My friend thought his tacos were fine if bland, and his beans were dry. Because most of the beverages are $7 or $8, we stuck to water. So, eating here is a bit more expensive, and whether it’s worth it is an individual decision. My friend’s opinion is that vegetarian options are fairly easy to come by anymore, usually for less than Loving Hut was charging. Still, Loving Hut is a nice alternative to almost every other restaurant in the Inland Valley. The pedestrians aren’t walking under a ladder or in any danger of knocking the man from his perch. 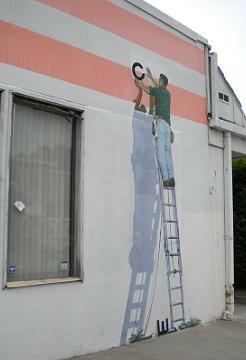 As you can see at right, the realistic-looking man and ladder are merely a painting. The painting of a man on a ladder adjusting a letter in a sign that no longer exists may not be long for this world, so I thought I’d better document it while I could. 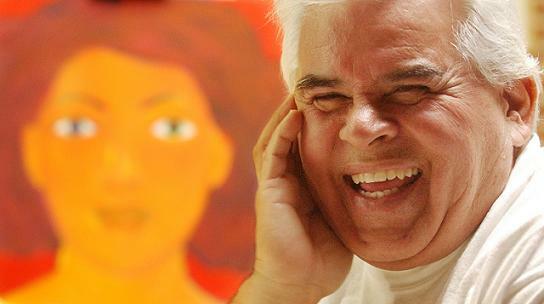 Gilbert “Magu” Lujan, a groundbreaking Latino artist dating to the 1970s and a sometime Pomona resident, died Sunday at age 70 of cancer. Magu got his nickname in childhood when his nearsightedness led friends to compare him to the cartoon character Mr. Magoo. Lujan’s colorful paintings and sculptures often used cartoonish forms to explore how Mexican and American cultures overlap: lowriders, pyramids, altars. “I think humor softens people’s view of my culture,” he told me in 2004. 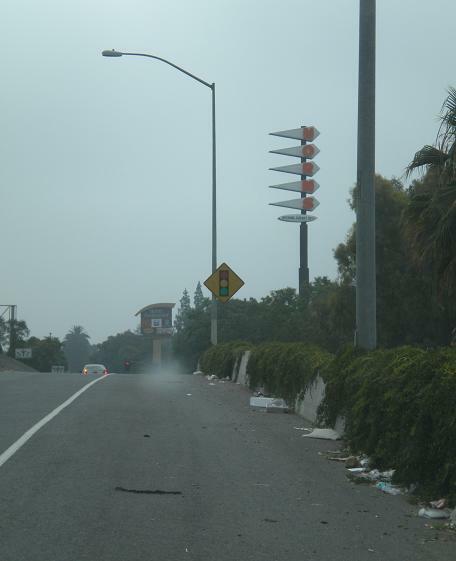 Magu represented the letter M in my “Pomona A to Z” series of columns in 2004-05. Here’s a link to that piece, and here’s one to the LA Times obituary. The dA Center for the Arts in Pomona is readying a Lujan exhibit, “Cruisin’ Magulandia,” for Aug. 13 to 30. 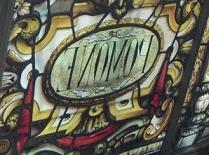 Friends are sharing their thoughts at the artist’s website, magulandia.com. 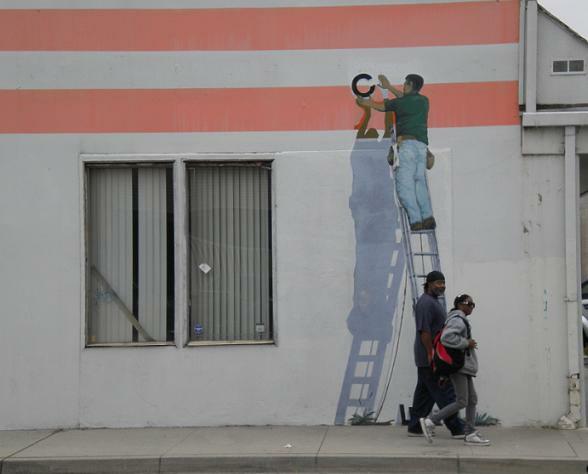 Lujan’s work can be seen in the Hollywood and Vine subway stop, which has benches with car-shaped forms and painted wall tiles with Hollywood iconography. An LA Weekly food writer, following up her “30 Burgers in 30 Days” project, downed “30 Scoops in 30 Days,” bingeing on ice cream and gelato. Unlike her meat marathon, this one brought her to the 909. 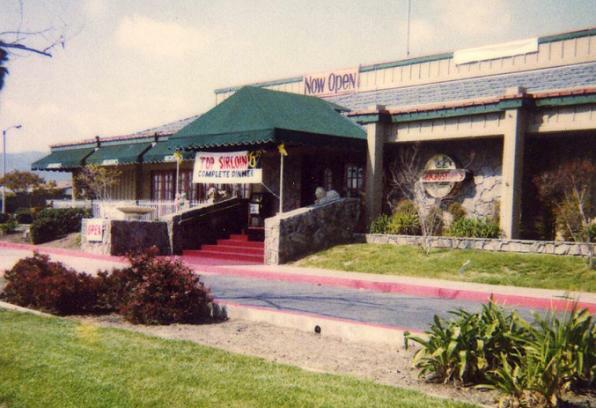 Shatkin also visited Farrell’s in Santa Clarita; a Farrell’s has been proposed for Rancho Cucamonga, and longtime residents will remember the long-defunct one at Montclair Plaza. Her wrapup gives Handel’s an honorable mention and lists Dr. Bob’s at the L.A. County Fair as a bonus — while giving the Fair’s location as Claremont. Has the Fair moved from Pomona? This might be her 31st scoop. Great writeups, though. Her visits — see the full list here — even included Rite Aid for its delicious Chocolate Malted Krunch flavor. 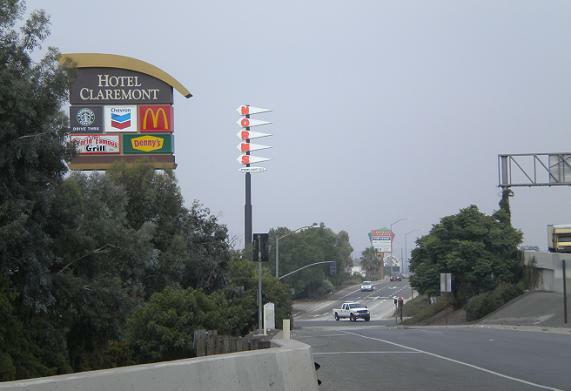 For Sunday’s column item about the new Norms restaurant sign in Claremont at the Indian Hill exit of the 10 Freeway, I needed a photo to illustrate the sign’s height. I shot a few from Auto Center Drive, seen above, and from across Indian Hill Boulevard. 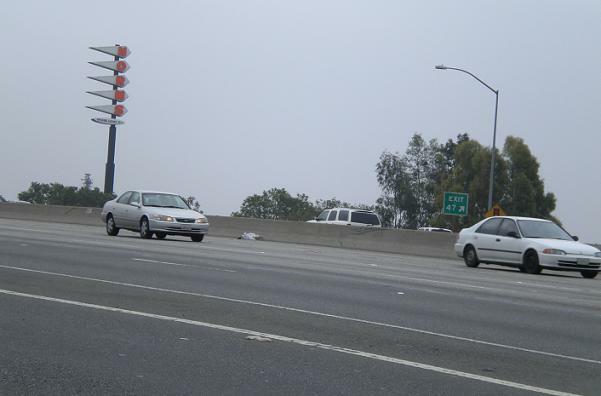 Unsatisfied with the results, though, I took my life in my hands and tried a few from the freeway itself. I headed west and pulled over onto the shoulder for this slightly askew shot out my window. Exiting at Towne, I turned around to head east on the 10 and, near the Indian Hill exit, pulled over to the shoulder for this shot, below, through my windshield. Continuing down the exit ramp and then up the onramp eastbound, I pulled over to the shoulder, leaned out the window and shot the one above that also includes the Hotel Claremont sign. I don’t know if all this was worth it, but these attempts ought to get the idea across: It’s a tall sign. And my pulse rate was likewise elevated. Sunday’s column will mention Pomona Sprout, one of the more minor characters (but one with a catchy name!) of the Harry Potter book and movie series. I searched online for info, found this absurdly informative wiki page about her and decided it had to be shared. Opened in 1958, Grinder Haven, which specializes in the sandwiches known variously as grinders, subs and heroes, is among the oldest restaurants in Ontario. You walk up and order at a window and dine at a picnic table under an overhang. A large neon sign with beckoning arrow stands by Holt, which was once akin to the Route 66 of Ontario. 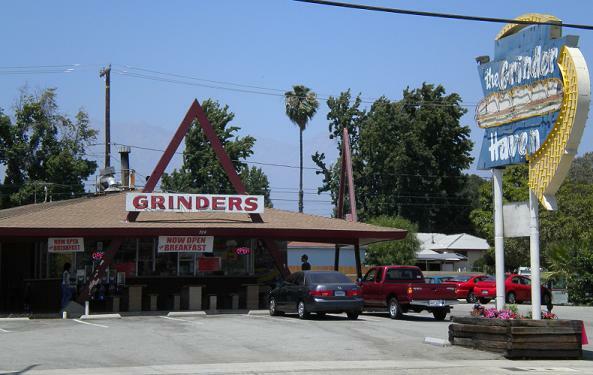 I’ve written about Grinder Haven’s history in my column; it began as D’Elia’s Grinder Haven and was sold in 1973 to John Goble, who shortened the name and owned it until 2005. The Haven used to be famed for baking its own bread and for its attention to quality. Two subsequent owners no doubt meant well but stopped baking bread and cut corners. I stopped eating there. But I gave it another shot recently with a Grinder newcomer after hearing the place had improved. They have hot and cold sandwiches, $4.50 for a half and $7 for a whole. A half is plenty for a normal appetite. 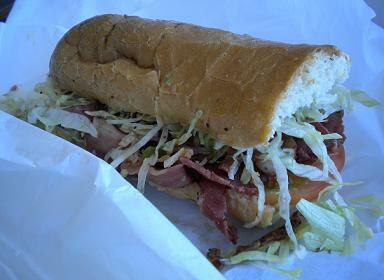 Hot sandwiches are pastrami, meatball, BBQ beef, sausage and BLT; cold sandwiches are ham, salami, turkey, tuna, capocolla and beef. They also have burgers and fries. I had the pastrami and my friend had the meatball. The pastrami was okay, better than my last visit but not as good as I recall from better days, and my friend said the meatball sandwich was bland and tasteless. He didn’t finish it. The restaurant continues to buy its rolls instead of baking them. Grinder Haven is still a classic, and there’s something unique about dining there on a warm day. For those who remember its quality-conscious era, though, Grinder Haven isn’t “back.” But it’s been worse. A post here about restaurants that had formerly occupied a building on eastern Foothill Boulevard in La Verne, inspired by a question by reader Tom Gay, brought a note of (intended) correction from reader Tom Meader. Meader is mostly right, partly wrong. Cattleman’s did spend most of its life in western La Verne, but it evidently did move to the Ford property in eastern La Verne for a brief period before closing, according to Eric Scherer of the Planning Department. Cattleman’s began at 1504 Foothill Blvd., near Wheeler Avenue, in a building fashioned like a lighthouse, with beams and pulleys, as if the cattle boat had just pulled up at the dock. Everybody into the kitchen! 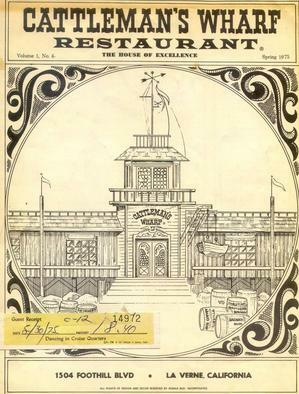 The menu cover gives a date of 1975; click on the thumbnail version for a larger view. In the early 1980s, Cattleman’s seems to have moved to the Ford property before vanishing, according to Planning Department files. So Cattleman’s Wharf existed in both locations, making both Toms correct. I love splitting the difference. Everyone’s happy (or unhappy). 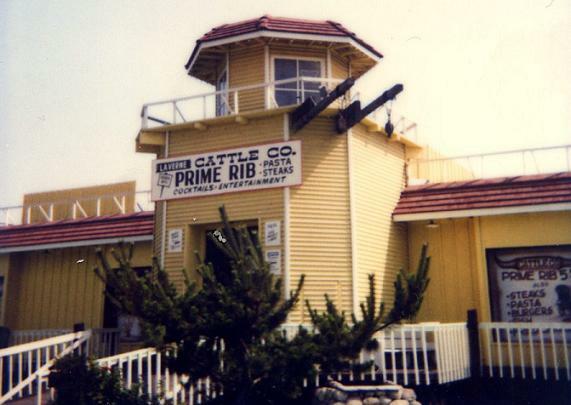 The Cattleman’s lighthouse later housed the La Verne Cattle Co., as seen in the photo below, and Toppers, a restaurant that morphed into a night club and was shut down in the late 1980s. The building was demolished in the 1990s and the site became a Pep Boys and a 99 Cents Only store. 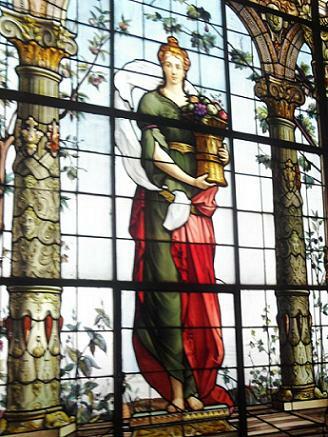 Four months after my own visit to Mexico City (or Distrito Federal, as it’s known), reader Elizabeth Casian went there herself. And while there, the Pomona resident found not one but two Pomonas. Heck, i didn’t even find one. Two Pomonas while on vacation? Casian must have felt right at home. 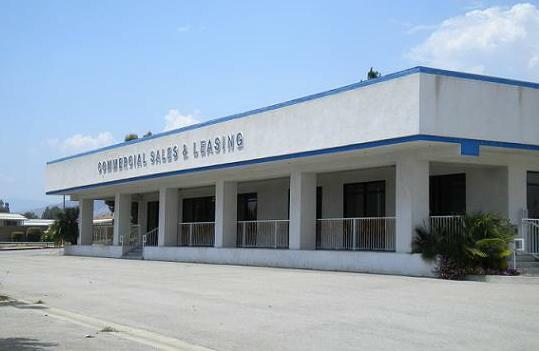 The former Person Ford car dealership at 2777 Foothill Blvd. 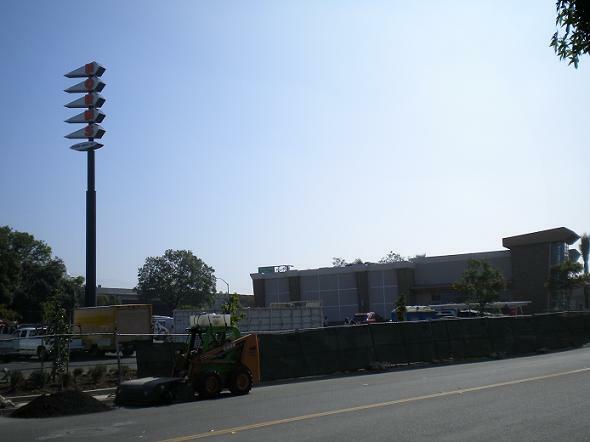 in La Verne is set to be redeveloped into apartments and retail. But reader Tom Gay remembers when the building at the west end of the dealership was a restaurant — or a series of restaurants — from the 1970s into 2004. Good idea. I contacted Eric Scherer of La Verne’s Planning Department and he was kind enough to research the files. Information isn’t complete, but he found that the building in question went up in 1976 and housed Lizzy’s. Just think, you could have dined in the Betsy Ross Room, then headed east and gotten dessert at Betsy Ross Ice Cream in Claremont. Finally, 1992 brought a stable restaurant: Phoenix Garden. The Chinese sit-down eatery lasted in the building until 2004, when it moved downtown and Person Ford took over. The building was used for fleet and truck sales rather than kung pao chicken, then closed out its life in 2009 as the location of Foothill Hyundai. “With the new mixed-use development approved for the site, all of the buildings will be torn down,” Scherer reports. Let’s hope the mixed-use development doesn’t have a revival of the Torch. Anyone remember more about these past restaurants?